Stock buybacks may be back as blackout session ends, but suddenly companies' appetite to repurchase their own shares appears to be slowing sharply. 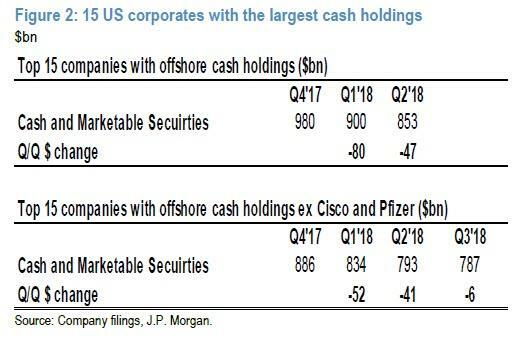 After an initial record surge in the amount of US corporate cash repatriated from offshore jurisdictions (if only for accounting purposes, as the bulk of said cash was already largely invested in domestic securities via offshore entities) following Trump's tax law overhaul and tax repatriation holiday, the movement of foreign cash has slowed sharply. 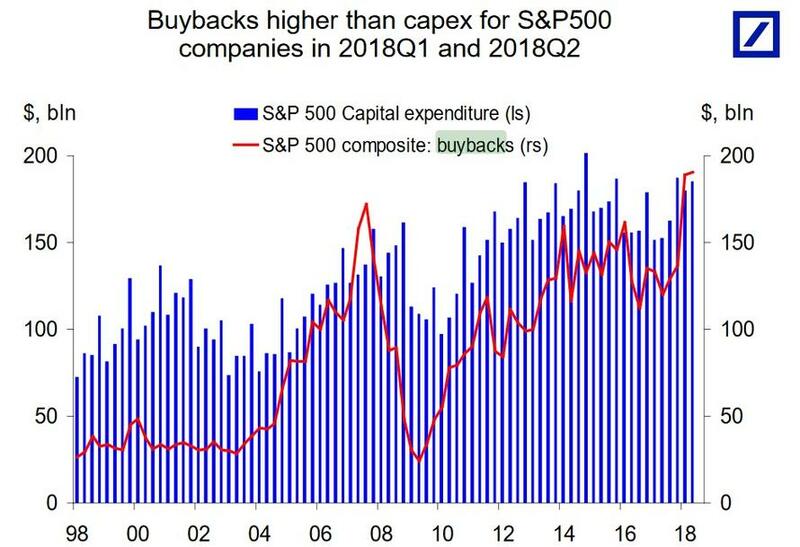 This comes at a time when record notional corporate buybacks have not only surpassed total capex spending for the 2nd quarter in a row, but have been seen as responsible for the relentless bid supporting the stock market. So why are offshore fund flow important? Because, as many strategists have noted over the past year, with JPMorgan's Nikolaos Panigirtzoglou doing so most recently in his latest Flows and Liquidity report over the weekend, US repatriation flow are a key leading indicator for US stock buybacks. 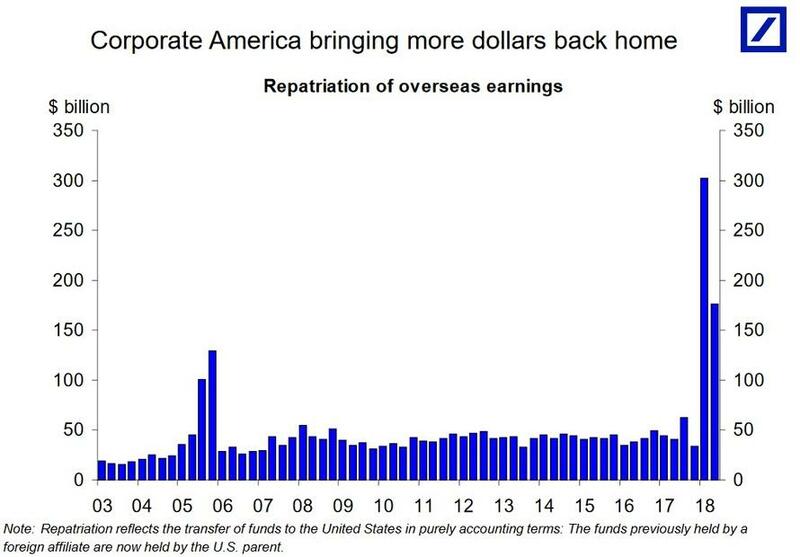 And the problem for stock market bulls, is that recent data are consistent with this idea that offshore cash repatriation is slowing considerably and by implication, so are buybacks. portion of cash has switched location from offshore to onshore. 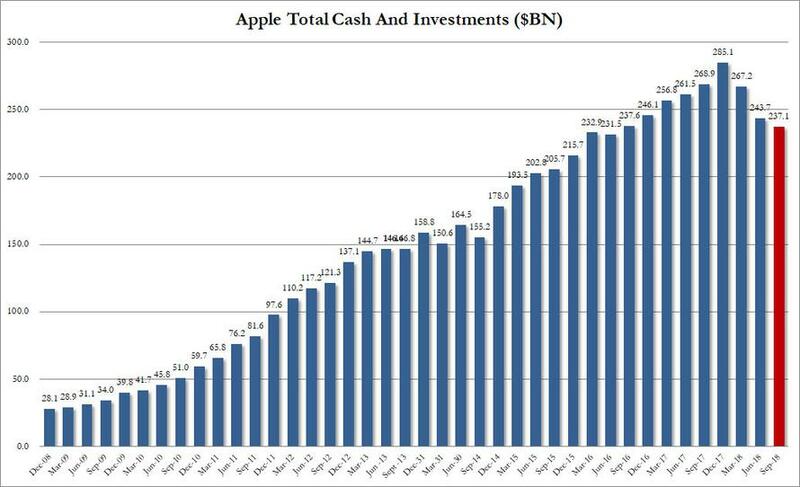 But when the repatriated cash is deployed - as has been the case with Apple for three consecutive quarters - in order for the company to buy back shares or to fund other activities, then the overall amount of reported cash holdings should decline. To determine internal corporate fund flows, JPM looked at the overall cash holdings for the universe of the 15 US companies with the highest cash holdings, all of which are outside the financial sector. It found that the reduction in reported cash holdings during Q3 was only $6bn, though this excludes Cisco and Pfizer which have not reported their cash holdings yet. This compares to a reduction of $47bn in Q2 and a reduction of $80bn in Q1, confirming a sharp deceleration during the first three quarters of the year. The second piece of evidence comes directly from the amount of announced US buybacks, which also shows a similarly decelerating pattern. The next chart shows the monthly trajectory for announced buybacks for S&P500 index companies. Following an accelerating pattern during the first seven months of the year and a peak in July, alongside the market hitting new all time highs, the flow of announced buybacks has been very small for three months in a row. 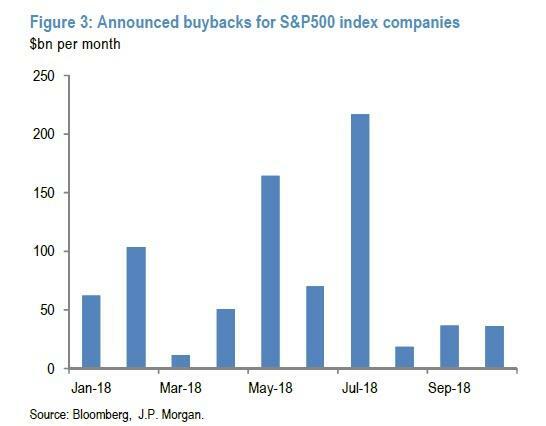 Curiously, while some have blamed the "buyback blackout" period for the buyback slowdown in October - if not the overall slump in the market - JPM points out that one cannot actually blame this weakness on the reporting season, as July was also a reporting month but saw the highest buyback announcements for the year. And since actual buybacks follow announced buybacks with some lag, the picture of Figure 3 "points to a slowing trajectory for actual buybacks also." 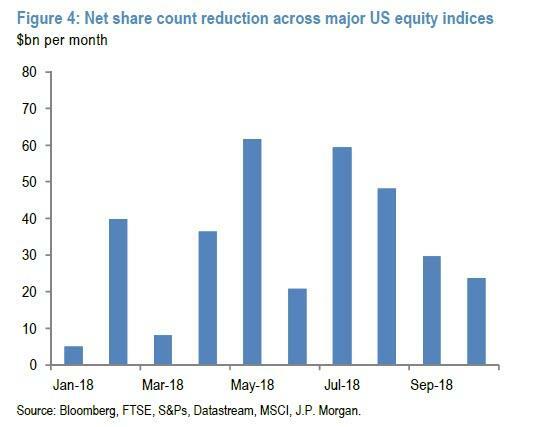 Indeed, this is confirmed by the next chart which shows that actual net buybacks - proxied by the net share reduction across major US equity indices - has also been decelerating notably since July. To be sure, the data ends around Sept. 30, and fails to capture the key changes to the corporate buyback mindset that took place during the October market rout, when due to the sharply lower prices, buyback may have increased, or alternatively as CFOs and Treasurers tend to fall into the same momentum chasing pattern as most other investors, it would be more likely that repurchases hit a brick wall as markets tumbled, ironically just as buybacks should be surging. Here, it is worth noting that while it represents a single observation, over the weekend, Berkshire Hathaway responded to the sharp drop in prices by showing a growing appetite not only for stocks in the third quarter, by purchasing $12.6 billion worth of stocks in Q3, more than any one quarter over the last four years, buy also engaged in a rare move to buy $928 million of Berkshire's own shares as Buffett seeks to allocate some of his giant, $100+ billion cash pile. Whether or not other companies follow in Buffett's footsteps remains to be seen: for now the scarcity of new buyback announcements, even as company debt loads reach new all time highs, is troubling. And, as JPMorgan concludes, if this trend of slowing buybacks continues, "the extra boost that US repatriation provided to US equity and bond markets via share buybacks and corporate bond redemptions is largely behind us."